My sister brought home some fancy hight-tech Gelish Gel Polish that must be cured using a very expensive UV LED lamp. I was interested in how the gel work but could find any description. To ensure proper application of the the gel you have to follow more than 10 steps and apply different kind of polishes and cure them with this lamp. The interesting part for me was the lamp itself. It does not look anything special just an 10×3 array of 30 LEDs and a timer switch. Unfortunately I was not allowed to open the device because it is still under warranty and sister would not be happy if anything should go wrong in the process. I presume that the circuit board inside has very simple design. To replicate it you need a bunch of LEDs, some resistors to limit the current through them and an optional timer circuit. My intention was precisely that, to make my own cheap version of the original lamp. 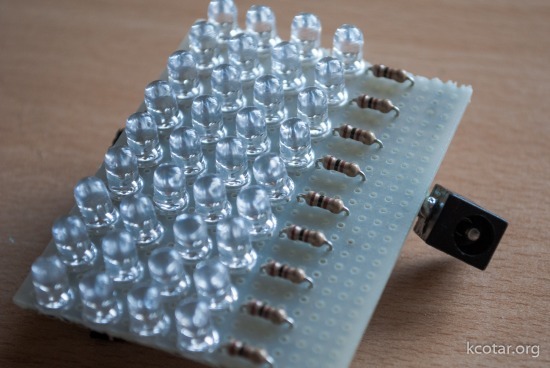 The result is this simple 8×4 array of 32 diodes.